Let me just start off by saying that I know nothing about this show. To be honest I kind of like that. It's nice for a change to walk into a theatre with no prior knowledge of what you are about to see. Now don't get me wrong. I like revivals as much as the next guy. In fact The King and I is one of my favorite shows of all time. I also like new plays too which is why I am particularly interested in seeing Airline Highway.Plus the title just sounds really cool. The show which is now in previews at the Samuel J. Friedman Theatre will officially open on April 23 and play thru June 14. So what's the show about? Good question. So why don't we get right to it? Here is a brief synopsis about Airline Highway from the show's official website. Enjoy! In the parking lot of The Hummingbird, a once-glamorous motel on New Orleans's infamous Airline Highway, a group of friends gather. A rag-tag collection of strippers, hustlers and philosophers have come together to celebrate the iconic burlesque performer Miss Ruby. The party rages through the night as old friends resurface to pay their respects. 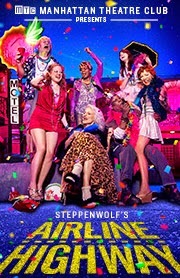 A world premiere written by Pulitzer Prize finalist Lisa D'Amour (Detroit) and directed by two-time Tony winner Joe Mantello (Casa Valentina, Take Me Out), Airline Highway is a boisterous and moving ode to the outcasts who make life a little more interesting. Intrigued yet? I know I am. Like I said I love new plays and this one sounds right up my alley. By the way for those of you who want tickets to see Airline Highway you have come to the right place. We sell them. In fact if you call now you can get tickets to see the show at some incredible savings. Be advised that while this "Special Offer" is good thru June 14 it is not good for Saturday evening performances and as always subject to availability. Get your tickets to see Airline Highway on Broadway at the Samuel J. Friedman Theatre. Who knows? Maybe I'll see you there. Until next time theatre fans.